So I think we all know by now that it’s rather rare for me to be talking about anything relating to hair around these parts; I’ve made it very clear in the past that haircare is something I only do because I have to do it, so most of the hair products I talk about seem to be negative reviews. Well, let’s consider today’s post as something that’s rather different from the norm because (shock horror), I adore this stuff! After my most recent hair salon appointment (I call it that because it still excites me that my haircuts now comprise of more than just cutting my hair; who knew other people washing and fixing your hair could be so enjoyable!? ), I asked my hairdresser what product she kept on using to make my hair so much more voluminous (and quite frankly, exciting) at the very end of my hair appointments. Luckily for me, the front of my hairdressers is a sort of mini haircare shop so after she gave me a quickfire rave review, I decided to take a bottle home and see if I could recreate the magic she’d done for myself. We all know very well that recreating the perfect hair that your hairdresser created when you were in the chair is totally impossible as soon as you get home, but using this did help me to get 90% of the way there. 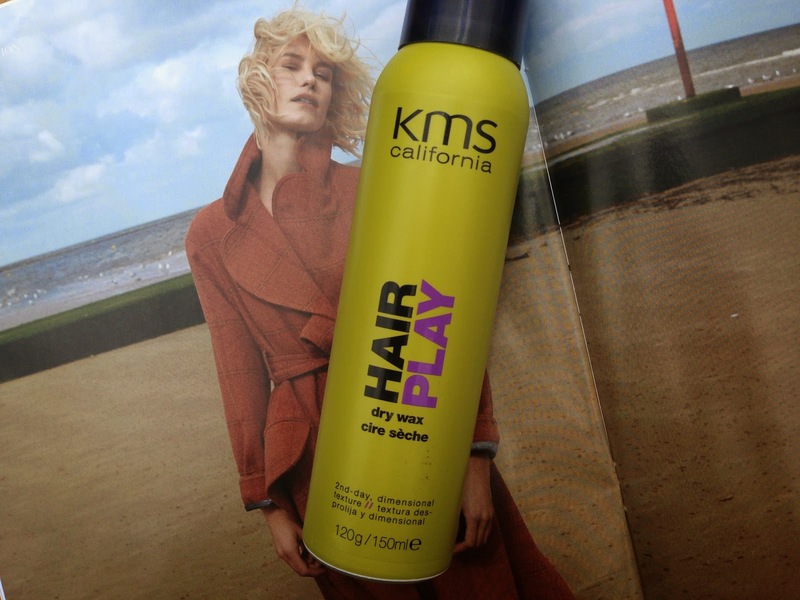 The KMS California Hair Play Dry Wax does what it says on the bottle: “2nd-day, dimensional texture”. I simply spray a couple of spritzes where I want it and style as necessary and for someone who has naturally very flat hair, this is a bottle of magic. I will admit to you all that at first spritz, I was very dubious as to whether or not this product was all that it seemed to be when she used it in the chair. Not only did my hair feel wet after I first applied it, I also felt greasy because of it which is obviously something that none of us want. Regardless, I persevered and after grabbing a bite to eat before leaving the house, my hair looked natural and just how I wanted it to be! I didn’t bother to include an image of the stuff in my hair because I’m sure that that kind of picture would only satisfy a very small demographic of you (I know for a fact that the vast majority of my blog readership is female and as most females don’t have hair like mine, it seemed a bit random). I can, however, give you reassurance that if volume and styling perfection is something you’re currently in the market for, this is something that is definitely worth considering.